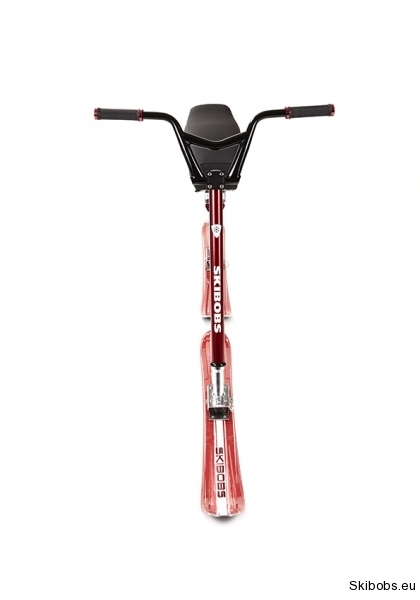 Ein Skibob erinnert mit seiner Konstruktion und der Fahrweise zumeist an ein BMX-Fahrrad. Von dieser Ähnlichkeit geht die Philosophie unserer Konzeption aus – die neusten Erkenntnisse aus dem Fahrradbereich (speziell aus dem Segment BMX) und aus dem Bereich des Skifahrens und der Skibobs zu nutzen und zu verbinden. Sorgfältig gewählte Durchmesser der Rahmenrohre, der optimale Winkel des Kopfrohres, die optimale Länge des oberen Rahmenrohres, die saubere und einfache Rahmenlinie, perfekt verschweißte Verbindungen, das alles garantiert eine perfekte Funktionsfähigkeit des Rahmens unserer Skibobs. Die Ingenieure, die sich an der Entwicklung der Konstruktion unseres Skibobs beteiligten, gehören zu der vollkommenen Weltspitze auf ihrem Fachgebiet. Dank unserer verantwortungsvollen Einstellung, der Zusammenarbeit mit seriösen Spezialisten und unseren fast zwanzigjährigen Erfahrungen in den Bereichen der Metallerzeugung, Metallurgie und des Sportes entstand ein wahres Spitzenprodukt. 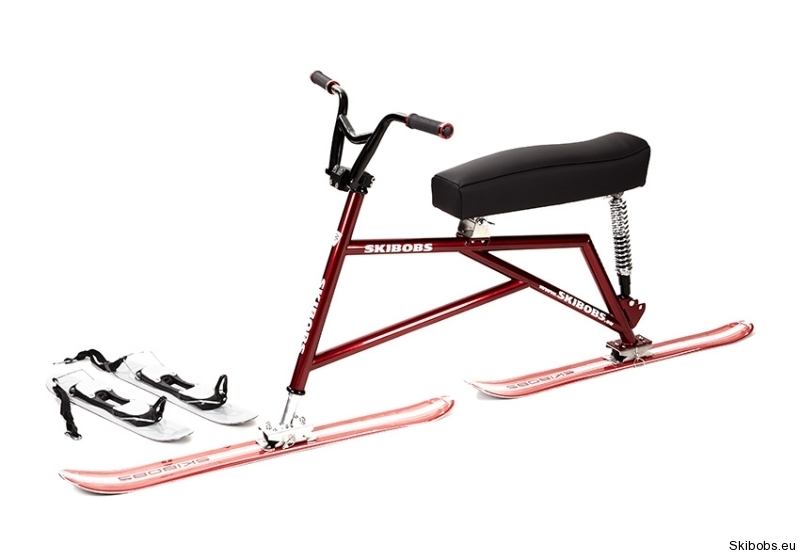 Obwohl unsere Skibobs primär für Amateurfans bestimmt sind, erfüllen sie alle Kriterien des Verbandes FISB (Internationaler Verband der Skibobfahrer). Material: Kombination von Edelstahl und vergütetem Chrom-Molybdän-Stahl. Dämpfer: Öldämpfer mit der Möglichkeit der Steifigkeitseinstellung je nach dem Fahrstil und dem Gewicht des Skibobfahrers. Maximaler Dämpferhub 8cm. Sattel: Manuell hergestellter Polstersattel aus Leder oder einem Hightech Material, das für Motorradsättel genutzt wird. Sie können aus zwei schönen metallisierten Farben (Blau oder Weinrot) und der luxuriösen mattschwarzen Farbe wählen. In der Lieferung sind nicht die Fußskier enthalten. Es handelt sich um Miniskier, die der Skibobfahrer an den Füßen befestigt hat. Diese Fußskier können an die meisten klassischen Skischuhe angeschnallt werden. Die Länge dieser Skier beträgt 55 cm, die Breite 88 mm. Diese Skier haben keine Taillierung, und daher sind sie völlig gerade. Es handelt sich wieder um Profi-Fußskier, die von unserer Nationalmannschaft genutzt werden. Der Preis für unsere Fußskier liegt bei 2.500 CZK. In this section we would try to answer your frequently asked questions regarding skibobs. Undoubtedly the price has the key role for any purchase. 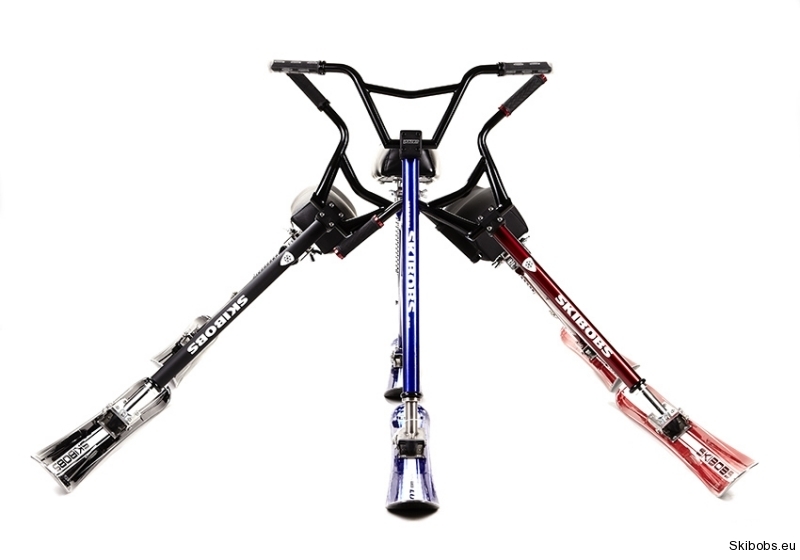 Nevertheless, when buying the skibob, it is necessary to consider also other factors to avoid the future disappointment after the first passed season. 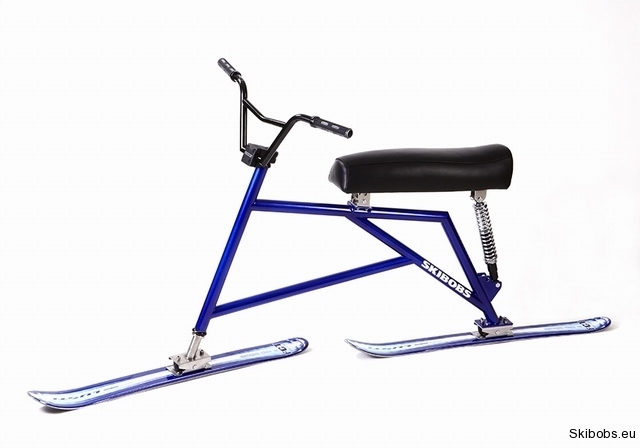 This is the basic presumption of safe riding, because it is the frame that considerably influences the riding features of the whole skibob. 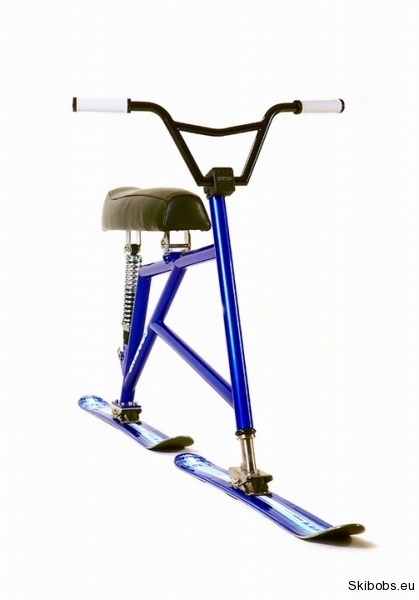 In case the skibob twirls and distorts under you during the riding you do not feet safe and cannot use the technical options of the skibob at all. You can encounter such problem at producers who try to decrease the weight of the skibob at any price. In order to reach this they use too much thin non-welded tubes for the construction of their frames, various plastic quick couplings and plastic parts. 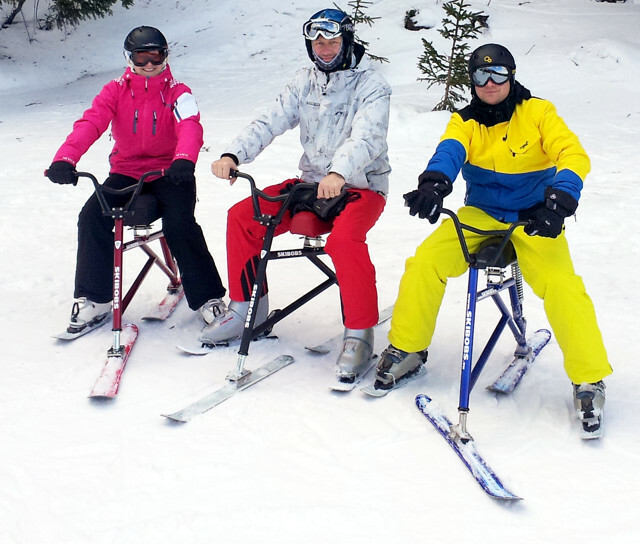 (The producer of racing skibob will try to reach the skibob weight of the 23 kg limit. 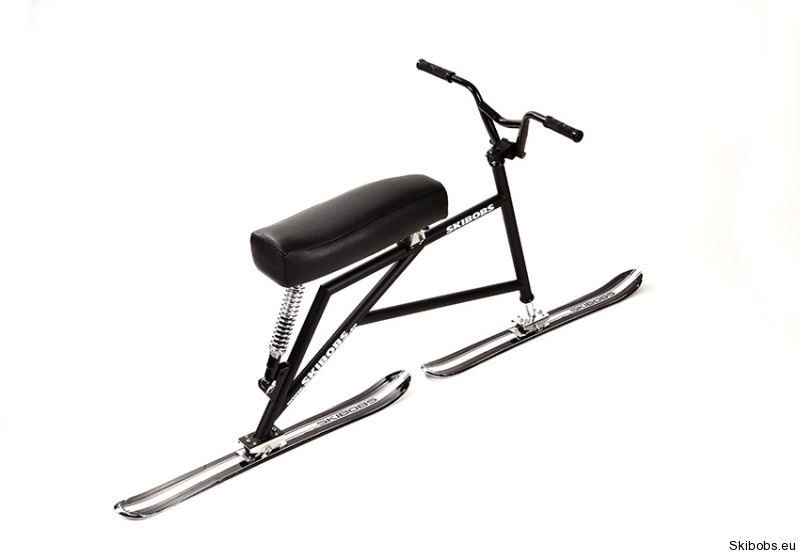 On the contrary, the producer of recreation skibobs supposes that the hobby rider prefers the joy of riding instead of the speed limit overcoming and thus he tries to reduce the skibob weight to the minimum). It is always important to find the suitable compromise of the weight, fatigue strength (life service) and the frame rigidity. Besides the construction and the frame geometry the material of frame has its importance of course. Particular materials differ not only in the weight but mainly in their physical features. Hi-Ten steel – Today we find this steel even at the cheapest frames. Hi-Ten steel is solid and very weighty at the same time. Frames made of this steel are quite inclinable to corrosion, regardless the necessary surface treatment. Today the aluminium bicycle frames are mostly made of two types of aluminium alloy – alloys 6061T6, 7020T6, or 7005T6. (7005T6 is analogous to 7020T6, there is a minor difference in the chemical composition. The designation T6 determines the way of thermal treatment. In case of T6 it means the solution annealing and the artificial ageing or the hardening at the maximum rigidity.) 7020T6 reaches much higher rigidity values compared to 6061T6 (approx. by 20 %). It is necessary to perform the thermal treatment of tubes made of the alloy 7020T6 by drawing to release the internal stress. The solution annealing and the natural ageing are used for this. The solution annealing is usually made at temperatures 450 °C up to 575 °C during 6 up to 10 hours and shall be finished with quick cooling. Then, at the ambient temperature, the tubes start to natural age (to harden) with subsequent increase of their rigidity depending on the time expired from their solution annealing. The natural ageing shall be done in case of the alloy 7020T6 also after welding. During welding the tube gets warmed up around the welded joint and thus the structural changes occur and cause the change of mechanical features (softening and rigidity reduction). To reach back the original features given by the standard, the material shall be aged under the ambient temperature. During the first seven days from welding the material gets back its 90 % of rigidity, the resting 10 % are achieved in two or three weeks after welding, under the ambient temperature. This is advantageous not only at the frame production but also during the subsequent after- guarantee service in case of any repair. The alloy 6061T6 acquires the original mechanical features after welding by the artificial ageing, when the process of return to the original mechanical features is conditioned by heating. It is necessary to keep the welded piece under defined temperature and for the defined time (for example at 170 °C up to 180 °C for the period of 8 hours) and let it aged so that the required value of rigidity is acquired back. The process of artificial ageing is very demanding as for the time and energies and it is necessary to observe the defined values and times. This feature of the alloy 6061T6 subsequently limits the repairs of fames due to the unavailability of equipment for the artificial ageing process. Cr-Mo steel – The more expensive frames are today made of the chrome- molybdenum steel. They are welded from tubes of double wall thickness (so-called double butted) when the middle section of tube has thinner wall thickness and the ends of tube, where it is more loaded, are thicker. The frames of Cr-Mo steel are more tough and better absorb the terrain irregularities than the aluminium frames. Also the fatigue strength of Cr-Mo steel is considerably better than of dural. The higher weight could be a moderate disadvantage but a well done frame can compete with the dural frame without any doubt. Carbon – The carbon composite material is five times lighter than the steel and has six times better rigidity. It perfectly absorbs vibrations. It has nearly zero fatigue curve which means, simply said, that this material will nearly never get old and thus should not failure due to any breakage. The carbon has also some disadvantages. The high price is one of them. The second one, more consequential, is the fact that, during the production of the carbon frame, it is very important to observe the direction of fibres, their number, the proportion of carbon knitting and resin which is the binder of material and the number of layers of knitting. This all determines how and in what sections the frame will be flexible and rigid. The direction of carbon fibres in the frame determines also its resistance against shocks. Even we have stated that the carbon has nearly zero fatigue curve, the most important weak point of carbon is the vulnerability of its surface. The carbon frames are quite sensitive to the mechanical damage, and if the shock hits from the direction other than for which the frame is designed it can be destructive for the frame. 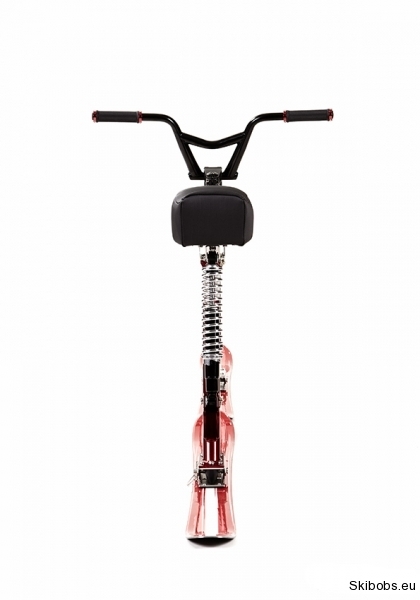 When a stone hits the frame tube or if a side shock occurs, these are the typical situations. After such damage the carbon is unrecoverable in fact. 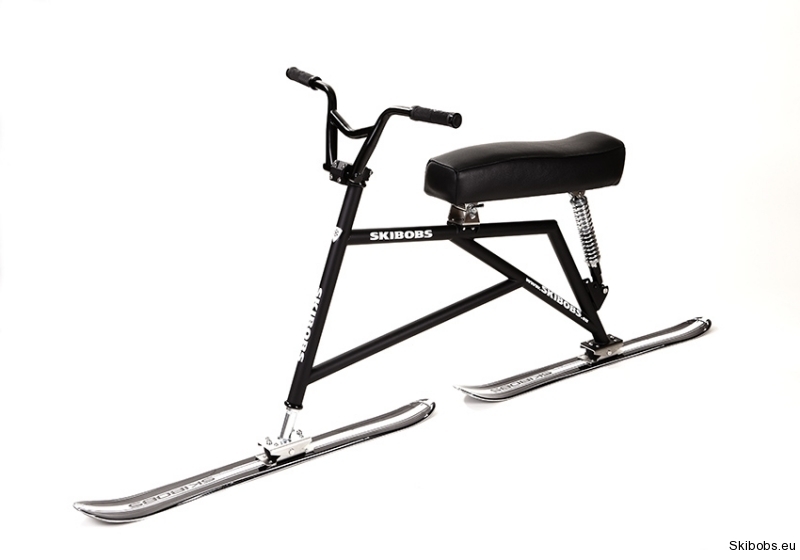 Regarding the fact that the risk that you crash with our skibob on a side is much higher that in case of a bicycle, we do not believe that the carbon is suitable material for the skibob frame. Titanium – The titanium would be absolutely ideal material for our purpose. The titanium frame is very light even its rigidity nearly reaches the steel. It is resistant against corrosion and the material fatigue. 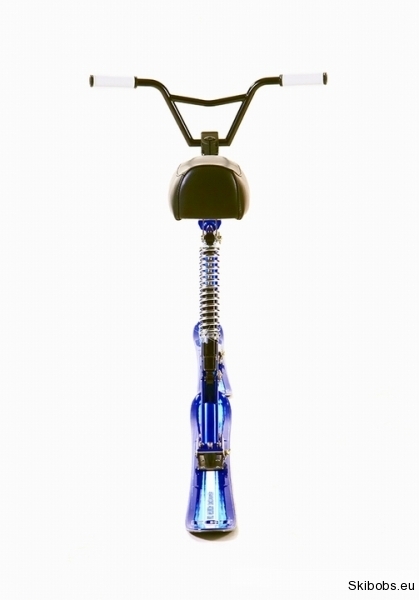 The titanium can absorb shocks and has the shape memory, which is its best advantage. If the frame lightly bends due to the shock, it returns to its original shape without any bending effect at the place of shock. The disarranged structure or bended tubes simply do not exist with the titanium frame. If a very strong shock happens and the car runs over the frame, there are only two options: damaged frame or fully undamaged frame. But, the titanium is very expensive and its treatment is very difficult. Smaller ateliers cannot afford such top technology. The preparation is elaborate, expensive and often requires years of development. The background shall correspond to it. It is necessary to exactly observe the technological procedure when working with the titanium. That is why only few companies, mastering the treatment of such material, produce the titanium frames. Most of producers take knowledge gained in work within the aircraft industry. We can say that the producer’s experience is the key factor for the final quality of the titanium frame. The frames are usually custom-made, manually made in small series and that is why their price is so high. 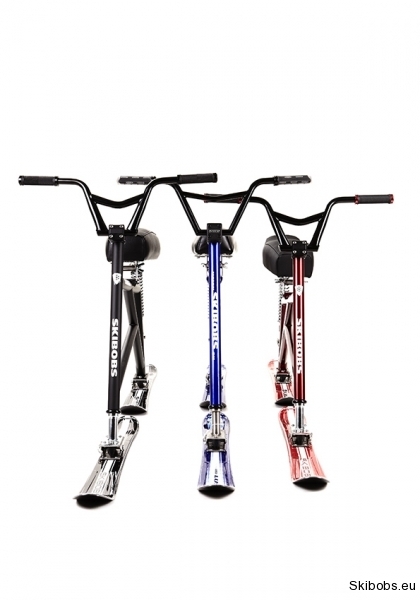 Based in above-mentioned features of particular materials and regarding the fact that the skibob is mostly similar to BMX bike, we have decided to produce frame for our skibobs from the Cr-Mo steel. As in case of bikes, the suspension is a very part of the skibob. There are producers who pretend that one suspension (one stiffness) is fully satisfactory. Do you really think that the same stiffness can fit to a woman of weight 57 kg and to a man of weight 100 kg? Most of gas, oil or air absorbers allow at least several levels of suspension stiffness. If the absorption is made with gum or rubber silent block (spring), it is not possible to adjust the suspension rigidity. It is simply fixed regardless your weight and your needs. 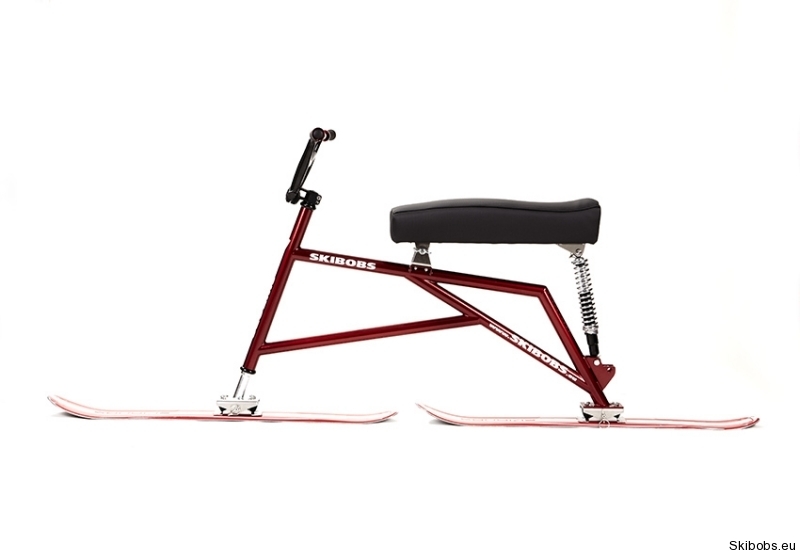 The simple and robust construction of the skibob ensures the minimum requirements on the maintenance and service. The more of complex mechanisms or plastic or rubber parts susceptible to breakage we have, the higher costs of their repairs are. Of course, the spare parts can be purchased, but at what price? Today we can find on the Internet various offers of self-assigned handymen and garage producers who offer the custom-made production of skibobs. 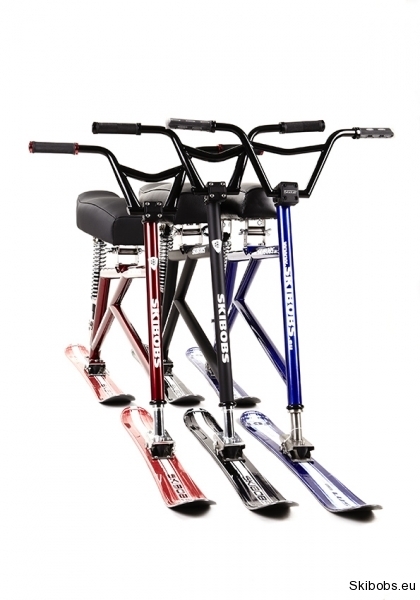 (This problem also relates to the amateur fanciers who offer production of various recumbent bikes, special bikes or scooters). Beside the fact that the price of such products is much higher than of our products, and in many cases it also equal to the price of top quality racing machine, we would like to call your attention to some related dangers. Above all, it means the breach of defined processes of production. Most of amateur producers commit the fault right at the beginning of production when they choose the unsuitable material for the frame production. The handymen have to do so because it is not easy to buy the required tubes of suitable material, as Cr-Mo 4130, Al 7020T6 or Al 6061T6. In most cases it is necessary to order this material from Asia where most of important bicycle producers have shifted their production, and this all in such quantity that is not acceptable for the minor producer due to costs. That is why most of these hobby producers choose various alternatives. They often choose tubes of absolutely common steel or of unsuitable aluminium alloy that do not fits for skibob due to its mechanical properties. Further faults result from it, mainly as for the welding. The welding of aluminium, stainless steel or Cr-Mo steel is generally very demanding as for the technological procedure. It is necessary to observe the correct way of pre-heating, parameters of welding, subsequent way of cooling etc. The welder shall be skilled in work with such materials and welding of such material shall be his main job. Otherwise the results are very poor. There are numerous cases when such amateur simply buys the first dural tube he see in the shop, without knowing the composition of given aluminium alloy, he starts with the construction of the equipment. Then he brings the cut tubes to another amateur, of the same enthusiasm, to perform welding. 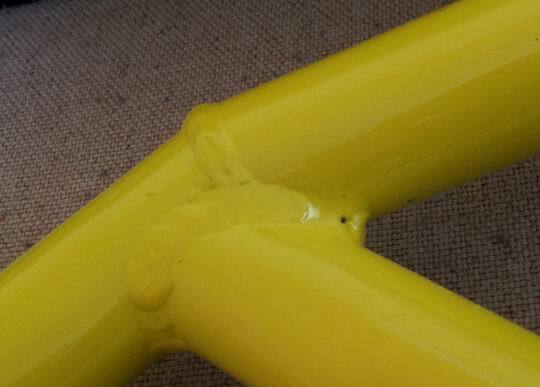 The unsightly welds, wrong welds or burnt material and fragile material around the weld are the results. Such amateur do not hesitate to take a picture of his fully loaded products to show the world what excellent product he made. He does not care that his frame resists only to the large static load, which is quite attractive at the first sight, but it says nothing about the frame reaction to the dynamic load and cyclic stress, being much more important points of view. The way of ski fixation is further nuisance that you can find at small producers. Also here we can see the reasons of it, as the small producers can hardly reach the necessary material; in this case it means the original screws of binding. So the improvisation comes here again. The picture shows that the binding is fixed by self-drilling screws going through the ski running surface. Not only the running surface has been damages, but in addition, the ski is weakened and can break in case of running over a small irregularity that would the standard skis produced under correct technological procedure master. Further often imperfections of amateur producers include for example the wrong frame geometry, wrong quality of final surface treatment, wrong seat (wrong material as well as realization) cheap “no-name“ skis… We do not want to judge all small producers but it is necessary to be attentive. Your health and safety are mostly concerned. 2. 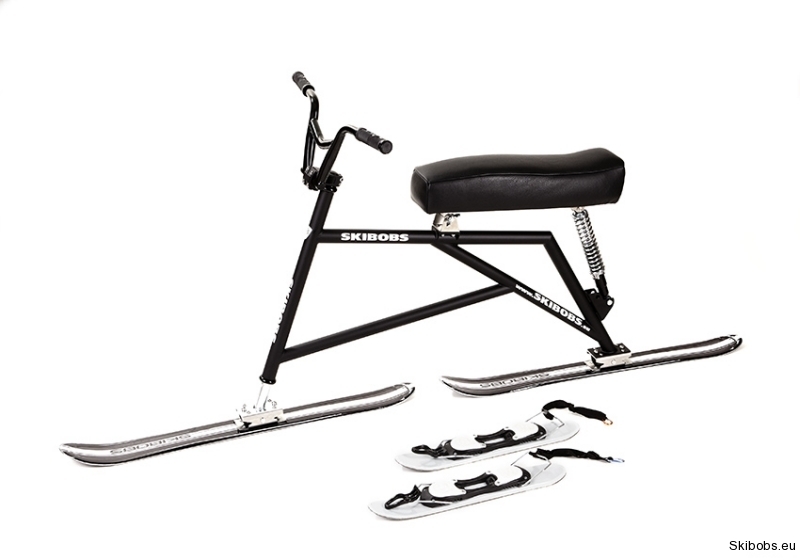 Shall I buy the original foot ski? 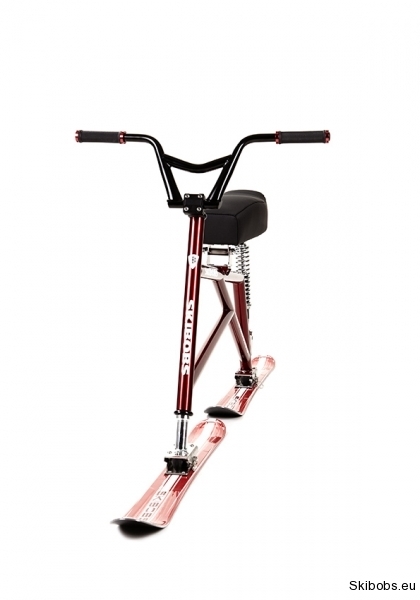 The foot skis are the mini skis fixed on feet of the rider and helping the rider to keep the stability on the skibob. 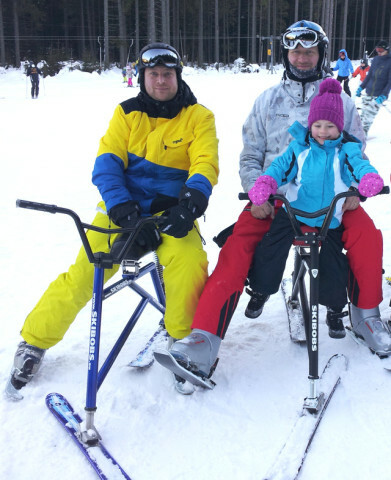 According to regulations of FISB they are the obligatory equipment of the skibob rider (without mini skis you can only hardly go up with the skibob using the ski tow). 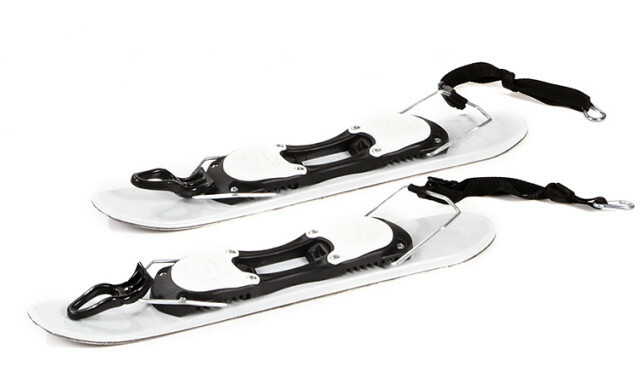 These foot skis can be fixed on the majority of classic ski boots. 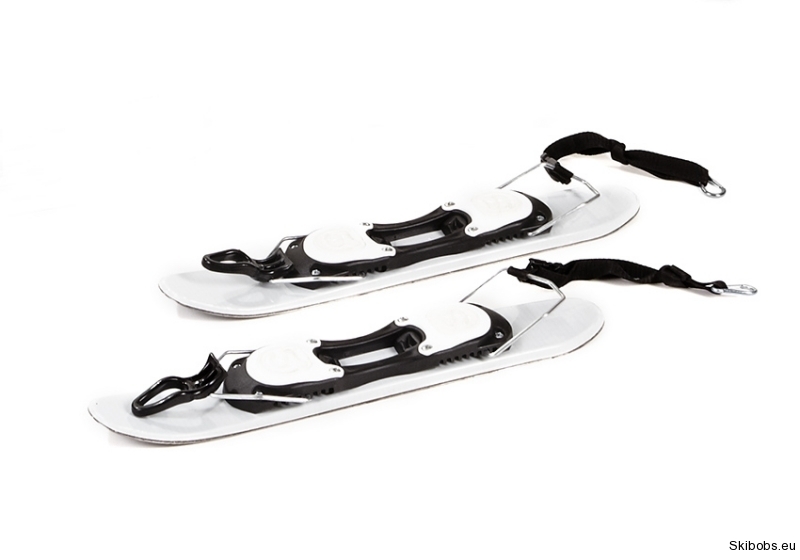 The length of our foot ski is 55 cm, the width 88 mm. These skis have no curve diameter and are fully straight. Again, this is the foot ski profile used also by our representation. The price of our foot skis is CZK 2500,-. We know that some of clients use old downhill ski, shortened by cutting and equipped with binding instead of the original foot skis. 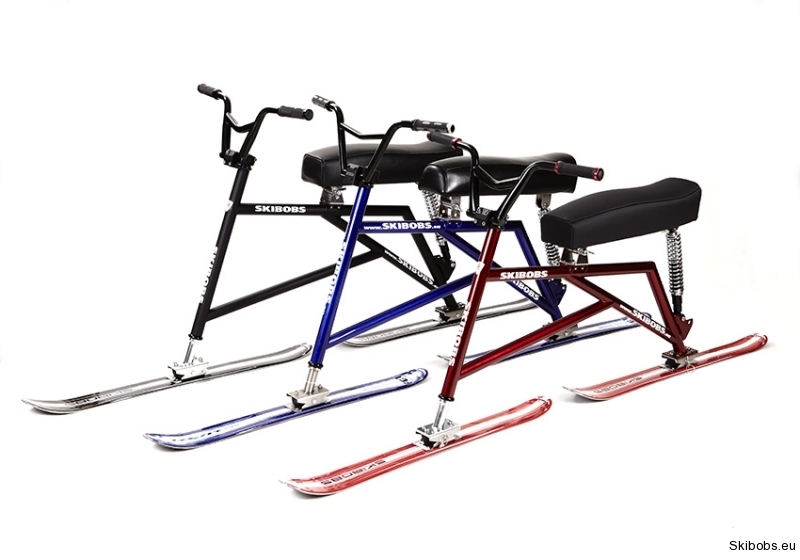 Of course, we cannot push our client to by our original foot skis, but we are convinced that the investment of CZK 2500,- will pay back for sure. 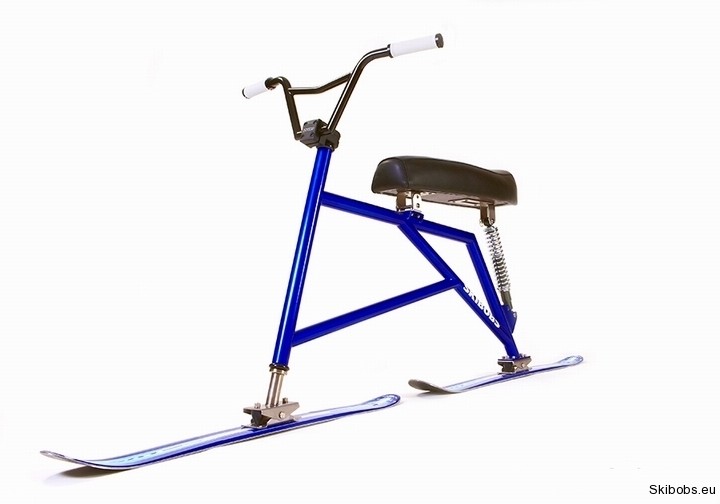 Please consider that the original foot skis have no curving. The reason is that they should behave neutrally because the skibob skis have some diameter. If somebody cuts off the downhill curving skis, having their own lesser or bigger diameter, then such skis cannot be neutral when going down the hill. Even if you find some old bazaar classic straight ski without carving, there is another very important reason to buy the original foot skis. It is their thickness of 14 mm all over their length (55 cm). That is why such skis can resist to an incredible load. Compared with downhill ski the ski thickness decreases towards the tip, often to only 7 mm. It is clear, which skis have longer life service.